“To be opened in the event of my death” With one swift, vicious movement, she sliced the envelope open, and pulled out a handwritten letter. love you and the girls… so sorry to leave you with this… cannot bear… The Husband’s Secret is a funny, heartbreaking novel of marriage, grief, love and secrets. When her husband announces he’s in love with her best friend, painfully shy Tess picks up her young son and returns to her mother’s house. There she begins an unexpected affair with an old flame. Rachel is a woman in her sixties consumed by grief and anger at the loss of her daughter twenty years earlier. When her son announces he is taking her beloved grandson overseas, Rachel begins a descent into deeper bitterness and pain. Cecilia is the quintessential “I don’t know how she does it” woman. A devoted mother to three daughters, she runs her household like clockwork, is President of the P&C, owns an extremely successful Tupperware business and is happy in her fifteen-year marriage. Until she discovers a letter in their attic labelled: “To my wife Cecilia, to be opened in the event of my death”… Her husband’s secret is a bombshell beyond all imagining with repercussions across the lives of all three women. I thought I had already read my favourite book of the year, but I am going to change my mind. The Husbands Secret is the BEST book I have read this year. The Husbands Secret had the perfect balance of everything. There was a secret to be revealed, family drama and relationships, great characters (there wasn’t one I didn’t like) and a believable story. This is the first book I have read by Liane Moriarty and the only reason I picked it up was because of the beautiful cover (Australian edition). Once I did pick it up I couldn’t put it down and read it every spare minute I had. This book had me thinking about it all the time; I had to remind myself it was only a book and the characters weren’t real. When I was getting towards the end of the book I found myself feeling apprehensive that the ending wouldn’t do justice to the book, but I am pleased to say it did. Liane Moriarty wrote a GREAT GREAT book from the first page to the last. If you haven’t read The Husbands Secret do yourself a favour and run out and grab a copy, you won’t be disappointed. 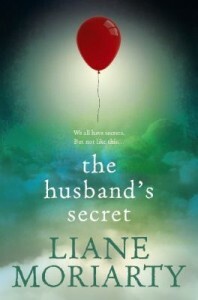 This entry was posted in Australian Authors, Fiction and tagged book review, books, Liane Moriarty, Parramatta City Library, reading, The Husband's Secret, Writer by admin. Bookmark the permalink.